Morality is a special feature of being human. Like equalism, morality is about how individuals and their groups relate to each other. Intuitively we get that morality goes with the groupish-ness of human being. Jonathan Haidt’s book The Righteous Mind: Why good people are divided by religion and politics (2012) happens to cast shedloads of evidence-based embodied and spiritual enlightenment on the nature of equalism. Ideologies grow from morality. We think we know how to be good people. We want to persuade or force others to be good in the same way. Equalism is a moral idea, an ideology too. 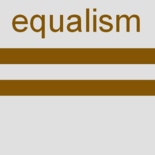 But equalism – as presented on this website – started mundanely like this: There are many heavyweight inequalities and ‘-ism’s. At the core of them all is a concern for harmful inequality. That must pair up with a core belief in its constructive opposite: equality. We think that an ‘-ism’ gives that positive aim a matching strong name: equalism. We include ‘respect for difference’ in our loose definition (see column to the right). So equalism means equal opportunity not equity of outcome – equity of numbers being at best a temporary short cut to superficial equality. Otherwise we have not defined equalism much as we explore what it might mean in relationships at ground level, at societal level and conceptually. Jonathan Haidt’s work is a rich resource to unpack further what moral foundations we find bundled together in equalism – in the inequalities, and in the equalities we implicitly wish for. There’s much more about the book on its website. This is my summary review of his book to show its relevance for equalism … and as a way to get you to read the book itself. Jonathan Haidt is a social psychologist in the USA who combines prolific academic brilliance and research with a highly respected world-wide public profile. It would take too long to list his other accomplishments. Here we can learn from his special interest in human morality. In his book The Righteous Mind – it’s more like three books wrapped into one – he writes really clearly about complex things, engaging your interest to make it an easy read. Haidt uses the metaphor of elephant and rider for human intuition working with and against our rationality. He shows that our moral decisions are mostly not decided by our cognitive reasoning. At least in the Westernised world, that’s the opposite of academic philosophies and pub discussions alike, which are based in rational thinking as the determinant of human moral choices. Most decisions, he shows, are made primarily by the individual’s intuitive ‘elephant’ while our cognitive reasoning or ‘rider’ is left to come up with some kind of rationale to explain or guide our intuitive decisions. Haidt shows that, left to our own devices, we don’t stick strictly to professed morality. The rider’s morals have more of a social function. It’s when we want to answer or persuade other people that we develop our moral reasoning. Those who have a strong moral community are more likely to work hard for the group – eg if you belong to a religion and have a sense of a God watching you. Remember that all of this – including how religion contributes – he bases on evidence within his own critical perspective of how reliable his arguments are. Haidt gives us a really useful way to think about nature and nurture, the epigenetic view that we’re born with potential, but only a ‘Version 1.0’ that is not fixed but interacts with our environment and experience. Our natural inheritance includes the human potential to employ universal ‘moral foundations’. Then – as with smartphones and laptops – use, life and experience generates successive later variations of the original programme, Versions 2.0, 3.0 and so on. In the end each culture and individual may have hugely varied expressions of what was originally the basic inherited potential. So Haidt digs into this universal and unique role for moral values in human groups. He explains how morality is passed on through evolution. Others say humans stopped evolving when social influences took over. But Haidt shows how evolution has been happening through the last 50,000 years of human existence. Group selection can be at work as Darwin originally suggested, not just individual selection. In fact, moral systems would be how human group-ishness survived and got passed on, being what makes one group more fit for survival than another group that doesn’t use moral foundations as much. The problem of ‘free riders’ has been used to explain why group selection cannot pass on altruistic morality. But again moral functioning in a human group is the way less altruistic ‘free riders’ would be dealt with. To a medic / biologist, this is a fascinating section on evolution; but others might prefer to skim through it. Haidt jokily concludes that human nature is, at a guess, 90% selfish individuals and 10% altruistic social or group-ish in nature. The metaphor is: we are 90% chimp and 10% bee. So what are the now six (and counting) main universal ‘moral foundations’ that people hold dear in different ways and different proportions to form the basis for different types of culture. For each of these heritable moral foundations, Haidt constructs the evolutionary scenario that gave survival value to human groups. In the context of our increasingly secular world, the evidence shows, for example, that a particularly powerful (and therefore universal) feature is the morality that religion gives a social group. In the last section he uses his team’s huge international web-based data collection to explore how the polarised divisions in society (eg through religion and politics) can be tied to different combinations and variations of which moral foundations you hold. He shows that both ‘left’ and ‘right’ have important balancing ideas and contributions to make to ensure the human group as a whole stays both safe and creative. Essentially the ‘right’ focuses on the importance of having safe boundaries, while the ‘left’ focus on the importance of creative opening up. Human groups depend on these complementary qualities working together. Note that having a safe base for taking exploratory risks is the core of another inherited pattern of human relationship: Attachment (as in Bowlby’s theory; and now what is more of a science). Haidt shows that the political ‘right’ have the advantage. Their narrative appeals to voters on all six moral foundations, where the ‘left’ tend to value only the first two or three, denigrating the others. This is a surprising, richly applicable account that is deceptively simple. It is clear, reasonable, evolutionary, embodied, and evidence-based. Yet it helps to understand so much of the relational, spiritual and ideological grounding, the general group-ishness of human life. We can see how people constructively use and destructively abuse the moral foundations to create good and bad across the world. Many of life’s puzzles get less puzzling: like how individuals are both selfish yet so powerfully driven to fit in to social mores; how individuals group together but (even in your own family) may be very diverse in nature and personality. You can directly equate the positive aspects of the six moral foundations – care, autonomy, fairness, loyalty, authority, sanctity – with the broad notion of equalism. And you can directly equate the negative aspects of the six moral foundations – harm, oppression, cheating, betrayal, subversion and degradation – with the inequalities that upset us so much. Maybe you cannot see that loyalty, authority and sanctity – the more boundaried values – are necessary and positive functions for individuals and groups and societies. If so, you may have your politically left-wing moral spectacles on. To help those doubts, imagine a group that you really do value – maybe your family or your action group. Those groups will rely on just as much loyalty, structure, authority and what’s holy to them, as do those groups or social systems that you don’t approve of. Groups that don’t, won’t function or last long. Or simply imagine someone in your group breaking its values and rules. Imagine a personal relationship where there aren’t any of those boundaries or respect for differences. When ideological groups or individuals of any stripe become totalitarian states, small or large, boundaries are kept by coercive control, oppression or killing if necessary – maybe by the million. Again, the balance between the six moral foundations is lost – and so is equalism. Thinking it through shows the merit of all six of the moral foundations working together, with pushing and pulling all the time, in any functional human group. You can read more on the moral foundations website here. There’s a short illustrated Youtube of the whole moral foundations idea, plus an engaging TED talk from 2008. You can do the moral foundation questionnaires on the website to join the thousands of others who have learned about themselves, and contributed data for the research. Equalism is another broad name for the moral world that Jonathan Haidt’s book shows we are born for and variously strive to grow with. Do read the book. It enlightens and goes way beyond understanding equalism. This entry was posted on 19 March 2019 by Nick Child in Culture, Equalism in general, Religion, Species, Spirituality and tagged Equalism, Evolution, Jonathan Haidt, Moral Foundations, The Righteous Mind.